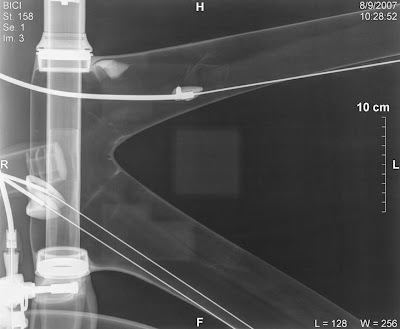 Though X-Raying is mainly for medical applications, the famous ionizing electromagnetic radiation can also be put to use on composite frame tubes to catch any internal cracks or defects. It is attractive because it is a non-destructive means of inspecting a piece and the rays have good penetration capacities. Shown in the pictures above is an Orbea Orca undergoing such a test. Take note that radiation can be damaging and only trained technicians can operate equipment. This diagnostic procedure, along with others like ultrasonic, hydrostatic, dye penetrant tests etc are often used in the quality control stages of tubular type product manufacturing like tubing and pipes. They are also used in the aerospace and power generation fields. 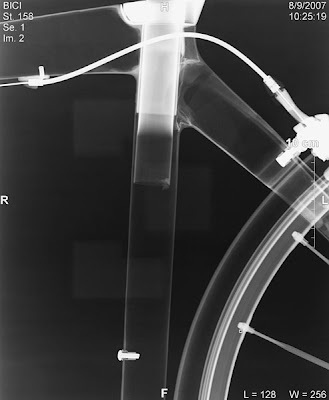 Who says a bicycle can't make a visit to the doctor? 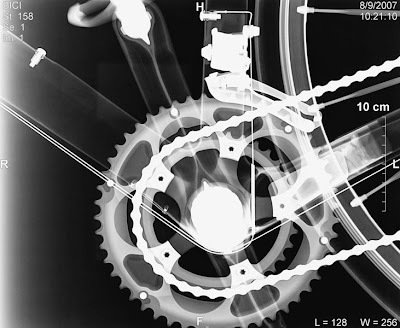 I never thought to x-ray a bike, thanks for the very cool photos... you could frame and sell these as art! Those photos do look awesome.